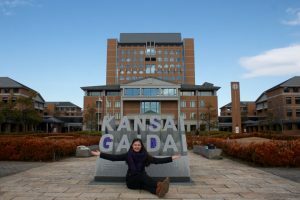 After having now spent four months studying at Kansai Gaidai University in the Asian Studies Programme in Japan, surprisingly, I would agree to a far extend that the Japanese culture can be indeed explained by it. No matter what I have expected of Japan before arriving here, in reality it was true or even stronger than I would have imagined. In general, Japan must not be viewed as a highly religious culture, however, several religious practices from Shinto or Buddhism are visible among people of all ages, in business contexts or educational contexts in daily life. Nevertheless, in most cases, they are part of Japanese life without any deep religious sense. For example, ancestor worshipping is a widely spread ritual in almost every family. 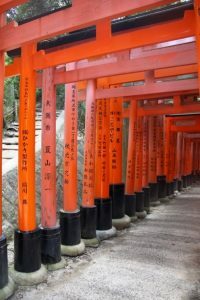 Moreover, in a business context, related practices to religion can be exemplified by dozens of red Shinto gates with company names on it, bought by large organizations at the famous Shinto shrine Fushimi Inari in Kyoto. The purpose of it is to bring good luck and fortune to a business, depending on the size and the cost of the Shinto gate. 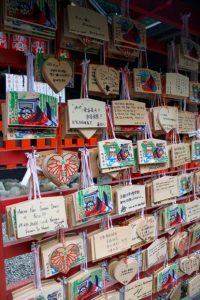 Also, all over Japan, lucky charms called omamori or emas are being purchased by many Japanese and tourists for specific wishes. These are usually this-worldly desires, such as wishing for high scores in college entrance exams. The Japanese society is highly group-oriented with clear hierarchies, noticeable in daily life. From the beginning on, one could experience that bureaucracy and long decision-making processes between employees and their superiors, or the sempai (seniors) and kohai (inferior to sempai) are guiding the society. Hereby, it is rarely seen that a group member would argue his own stand point. That individual would be the nail that sticks out which would contradict the social codes of behaviour. Even though it may seem frustrating or inefficient to us gaijin (foreigners), still, it surely has benefits for the Japanese as they have a strong believe and commitment to conformity, in other words, they are sticking to established systems. This cultural understanding, to even sacrifice ones believes and desires for the benefit of the group or the organization is deeply rooted in the Japanese cultural development influenced by Confucian thoughts. However, the strong sense of giving up the own benefit, even with the feeling of some pain, assures the individual´s social obligation to act appropriately in accordance with the norms. This understanding leads to giri, the term for Japanese reciprocal relationships. In Japanese life, there is giri in every single action. It is the obligation to care for others from whom one has received a debt of gratitude to build and maintain harmonious interpersonal relations. Hence, it has consequences that an endless process of gift-giving starts; as soon as a neighbour brings by leftovers from yesterday´s birthday cake, there is no possibility not to reciprocate this act, always estimating the value of the previous gift in order to not lose face. Also, the notion of uji and soto, meaning the inner and outer circle, is a concept leading social structures and behaviour. Considering the house architecture or the grounds of Buddhist temples or Shinto shrines, there is always a step or gate which has to be crossed to become purified from dirt and evil spirits from the outside world before entering the inner pure area. The same concept applies for relations. This can be also seen throughout the historical development of Japan, which has been influenced by the isolationism preserving the own culture, creating internal stability by reducing the power from outside. However, nowadays, as Japan is struggling to keep up their economic power, political attempts to increase internationalization might not be avoidable anymore, considering that international work force is needed because of strong factors such as demographic changes. In summary, these observations and learnings can constantly be experienced in various daily life situations. However, it must be recognized that these understandings are far more complex and interrelated with deeply rooted historical and cultural developments. 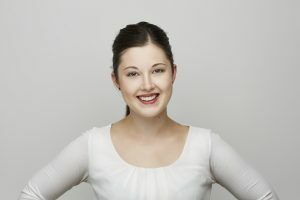 Once one, especially us gaijin, is open to cope with these social systems, it is an incredibly interesting culture to be studied and to live in. As values and fundamental believes regarding various approaches in daily contexts vary tremendously compared to the Japanese, the challenge is to find own adjustments and ways to conform with the strictly given rules without completely sacrificing our own background. Especially now, with an increasing international pressure on Japan, the importance of an intercultural exchange process is growing. Even though it takes more time than one would think, experiencing Japan is a great chance for self-development and to truly broaden one’s horizon, impacted by the unique culture of the land of the rising sun. Get to know more about the semester abroud during our Bachelor programs as well as our partner universities.